We are a leading Manufacturer of banana concrete bucket jack, banana type concrete bucket, coneside discharge concrete bucket, cow mouth concrete bucket and tower crane concrete bucket from Faridabad, India. We are a trusted name in manufacturing & Supply of Banana Concrete Bucket Jack and Ordinary Buckets for use of tower cranes spares. These are precision made having outstanding attributes. These are at par with functionality, technical accuracy, design accuracy and efficiency. We are a trusted name in manufacturing & Supply of Banana Type Concrete Bucket for use of tower cranes spares. These concrete buckets comes with screw jack. These are precision made having outstanding attributes. These are at par with functionality, technical accuracy, design accuracy and efficiency. On account of our prolific experience and knowledge, we are reckoned as a primary manufacturer and supplier of Coneside Discharge Concrete Bucket. This product range is manufactured by our skilled workforce using the superlative quality raw materials and advanced equipments. Our offered product range is highly appreciated by our clients due to its features like sturdy construction, excellent performance and high durability. 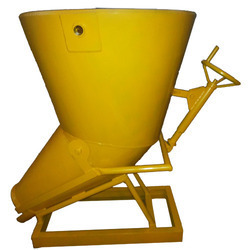 Coneside Discharge Type Concrete Bucket offered by us is widely demanded in construction industries for piling concrete. 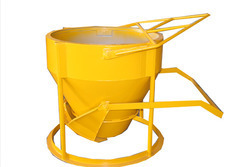 Bharat Engineering is one of the distinguished manufacturers of a wide range of Cow Mouth Concrete Buckets. These are designed and fabricated using high grade raw materials with the help of latest technology which ensures high durability to the buckets. 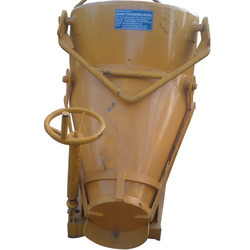 The entire range of Cow Mouth Concrete Buckets is broadly appreciated for its sturdy construction,corrosion resistance, compact design, high load bearing capacity and longer service life. These buckets are available in different specifications as per the needs of the clients. We provide our esteem clients an exclusive range of Cow Mouth Concrete Bucket extensively used for its quality standards. 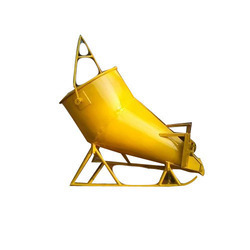 Designed using finest quality raw material this bucket is used to carry ready concrete mixer from one place to another place within the construction premises. We are reckoned in this domain as one of the most trusted manufacturers and suppliers of Tower Crane Concrete Bucket. Bucket offered by us is made by using premium quality raw materials and sophisticated equipments under the supervision of our adroit professionals. We offer a wide assortment of these concrete buckets varying in sizes and capacities to meet the demands of our clients. Due to features like robust construction, high load bearing capacity and durability, our offered Tower Crane Concrete Bucket is widely used to convey concrete from one place to other easily.